Welcome to our Holiday Expressions New Product Blog Hop! Our newest catalog was just released on September 1 and there are so many AWESOME new products! Deciding what to feature for this blog hop was a tough choice! I can't wait to see what everyone has created! If you came from Michelle Loncar's blog you are in the right spot! The hop is a big circle so when you get back to me, you will know that you completed the hop. Let's get started. For my New Product Feature I decided to showcase several new products including a new technique! 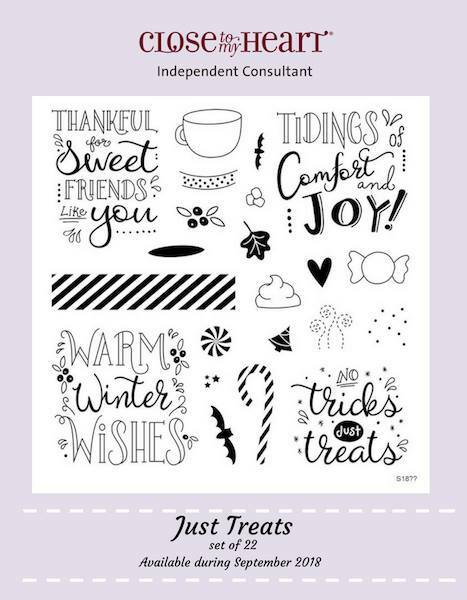 Check out my card, which is LOADED with lots of new goodies! When I decided to create a card using our new COLOR OF THE YEAR - SUGARPLUM, I needed help deciding which colors to use with it! So I grabbed our new Love Of Color book to see what was suggested. This new How To book features every color in the Close To My Heart's color palette in wonderful combinations along with beautiful artwork on every page! To compliment my Sugarplum choice, I used Sapphire, Sage and Linen. Next decision...... which new Thin Cut tag?? The new Fancy Tags thin cuts have 10 tags - 4 of them having stitching! To use as many tags as possible, I chose 4 to layer. You can see two of the tags I used had the stitching. The little tab behind the sage tag is one of the tags also. I stamped my tags with Grateful Heart Cardmaking Stamp using Charcoal, Sage and Sugarplum inks. I couldn't wait to try out our new texture paste! Using Design space, I chose a butterfly from our Artisty cricut cartridge and duplicated it a few times, then welded them together. I cut it out on the new Stencil sheets. Using the Matte Texture paste and my butterfly stencil, I added the texture paste to the lower corner of my card. It dries pretty quickly. 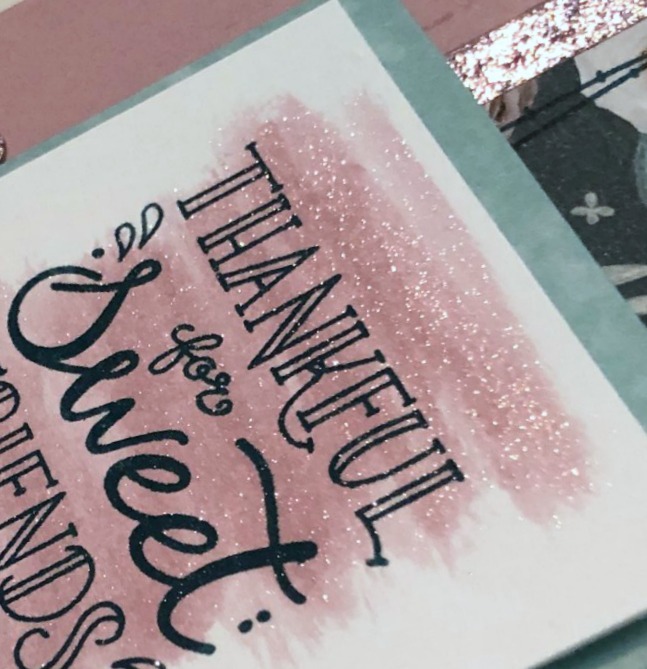 After applying the 2 sapphire cardstock strips for my accent color, I stamped around the edges with our new Stitched Borders stamp right on top of the texture paste! I gathered all the tags and tied them together with Mink Twine and added some Sugarplum gems. Now it is time to hop over to Alyson Mayo's blog and see what she has to share! 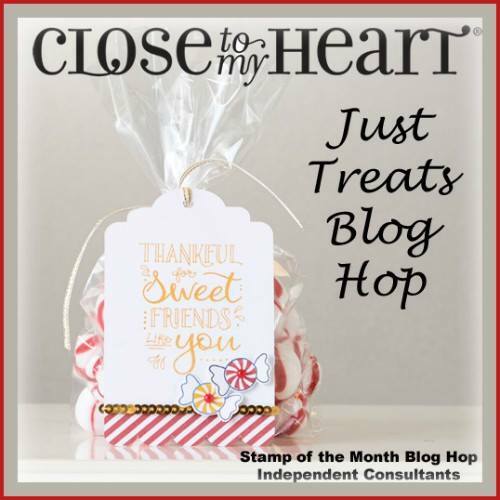 Welcome to the September Stamp of the Month Blog Hop!! This month's stamp is Just Treats. This fun stamp set has 22 images!! If you came from Lauren Moore's Blog you are on the right track! The hop is one big circle so when you get back to me you will know you have completed the hop! If you get lost along the way, you can see the entire list of participants HERE. I love this stamp because it covers Halloween to Christmas with some Thankfulness in between! So many occasions all in one stamp! 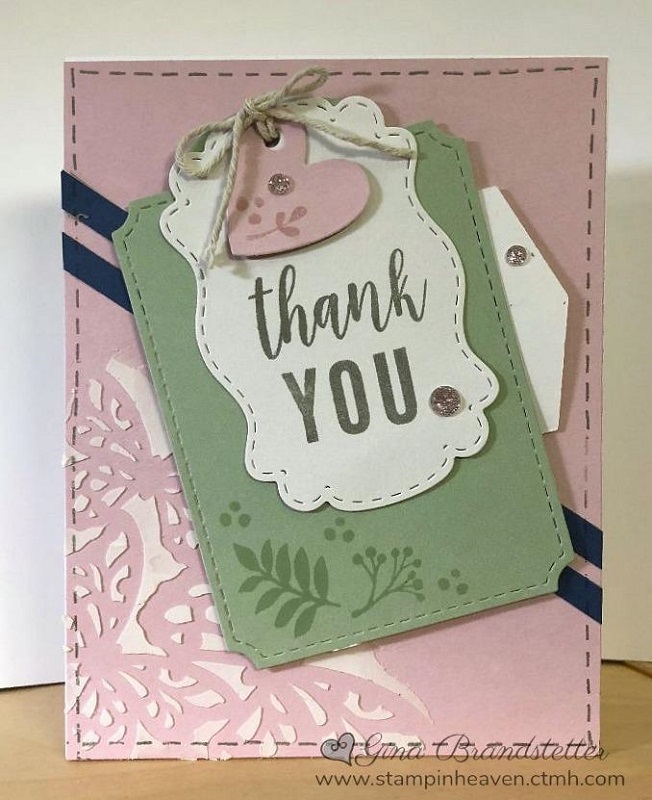 I chose to create a Thankful card using our new Boutique paper featuring our Color of the Year - Sugarplum! 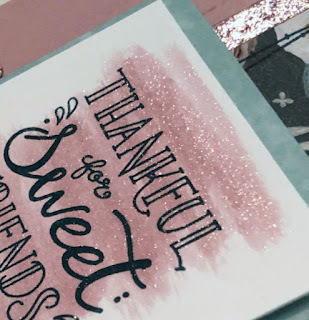 I brushed some Sugarplum Shimmer onto the white cardstock before stamping the sentiment in Peacock ink. I love how this shimmer looks! I wanted a decorative tea cup so stamped right onto the pattern paper and cut it out. I added a bit of trim with the Sugarplum Glitter paper and also used the new Border Stitches on both sides. The new Mink Twine and Sugarplum Glitter gems add the final touch. Here is a close up of the Sugarplum Shimmer Brush! This stamp is available only through September 30th. Now it is time to hop over to Haley Dyer's blog and see what she has created!